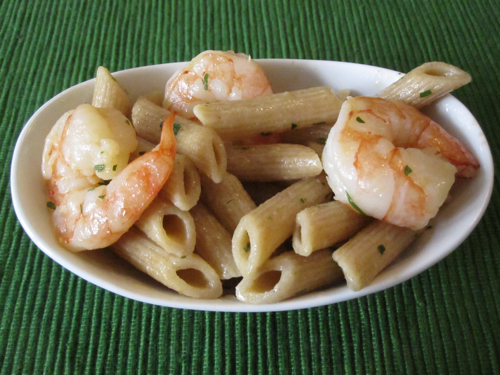 Pasta and shrimp. Two of my family's favorite foods. That's good news for me because they're relatively inexpensive (money saving tip_ buy pre-packaged frozen shrimp in your grocery's freezer aisle) and I can keep them on hand for quick recipes just like this one. I'm pretty sure that we eat shrimp or pasta in our house 5 days a week, so combining them in this recipe just made sense. This is one of those dishes I like to make on the nights that I'm exhausted (uh, that would be every night), and need something that is super easy to prepare, will be a hit with the family and looks totally gourmet. 1. In a large pot, bring 4 quarts of water and 1 tbsp of salt to a boil. 2. Cook the pasta according to package directions and drain reserving 1 cup of the pasta water. 3. While pasta cooks, heat 2 tbsp of the olive oil in a large non stick saute pan over medium heat. 4. Add the shrimp, garlic, salt and cook for 3 minutes. 5. Place the shrimp, garlic and 1/4 tsp salt in a saute pan and cook for 3 minutes, stirring halfway through (make sure not to overcook the shrimp). 6. Remove the shrimp to a plate and pour the clam juice into the same large pan. 7. Bring the clam juice to a boil for 5 minutes or until the liquid is reduced by half. 8. Whisk the butter, lemon juice and parsley into the saute pan and add the pasta, shrimp and as much of the reserved pasta water as nessecary to make a sauce to coat the pasta. Can you use chicken or veg stock if you dont have clam juice? Or is there something else you recommend? We had this this weekend and really enjoyed it! I added some grape tomatoes whole to simmer with the clam juice &amp; shaved parm on top. Fantastic!